Today's achievement was to get the tag-along bicycle up and running. 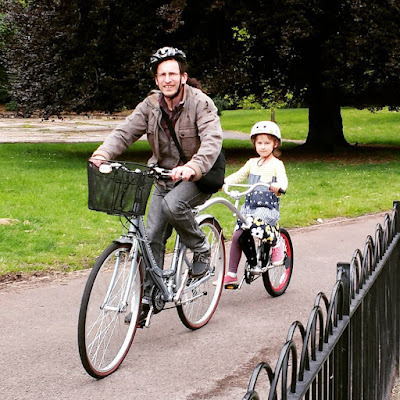 This has taken Dave a few weeks to achieve and it still needs some tweaking, but today we finally got to take the bike to the park for its inaugural ride. M was super excited and could hardly wait as first Dave tried towing the tag-along, then I had a go before we allowed her to hop on. It has been about seven years since I last cycled, so the pressure was on not to fall off as I was the first one to pull M around the park. It was hard work! M has no bicycle experience, so doesn't know how to lean and was laughing a lot as we set up, leading to a lot of wobbling. Thankfully, I managed to pull out of the wobble but it was touch and go a few times. Hair raising stuff. Dave and M, trying out the tag-along. Once we were off, Dave and I took it in turns riding around the park for the next half an hour or so, before I declared it was time to stop. M didn't protest too much as I suspect her bottom had begun to go stiff. Instead she had fun playing with a couple of children for a little while, then we walked home. I'd call the ride a success, but we might need to practice a bit to build up stamina for the Coventry Skyride, which we're booked onto at the beginning of next month.